The blog has been on hiatus for so long, it may take a bit to catch up but we plan to be posting more regularly in 2019. While we did take time off from posting our blog, if you have been following us on Facebook you know 2018 was very busy for us! We sold our American Eagle coach and moved into a different way of living when we purchased a 5th wheel and a semi truck to pull it. New rig is a Volvo VNL 730 to pull our Jeep and our 2014 DRV 38 SKSB3. There have been pros and cons of making this change up. 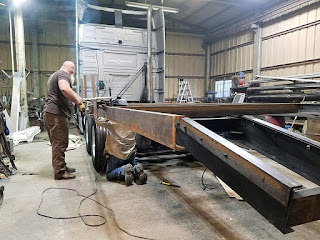 One of the biggest adjustments was/is having to make periodic (or as Brett says "frequent") stops for breaks as there are no bathroom facilities in the truck and Susan does not sit still well for hours at a time. Over last winter Brett was not seen much as he spent most of his time in the shop. He has always been a hands on kind of person and could not just sit idly by. It started with daily trips to the shop to supervise the bed build but ended with Brett assisting the fabricator. They planned, built, revised and probably crossed their fingers a few times. Then there was measuring, cutting, grinding, welding, re-measuring and LONG LONG days. 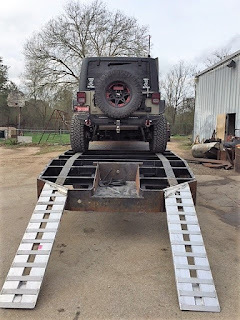 In the end there were a few additional modifications but we have a bed that meets our needs and allows us to trailer the jeep while pulling the camper. Brett worked side by side with Dwayne (our fabricator) to make sure they were both satisfied with the end result. Both men are perfectionist so the process was a little slower than we had planned and it took about 2 months for the build. The first test load - looks like it could work! Locked and loaded - ready to go home from the shop. Far less intense than building a truck bed but just as exciting was the new camper. It was an adjustment in many ways and we are thankful to our good friends the Kirbys for helping us with the delivery, initial set up and moving of all our belonging! We have more inside storage but less storage outside than we had in the motorhome. This required us to reconfigure and decide what we really need and what can go into storage. 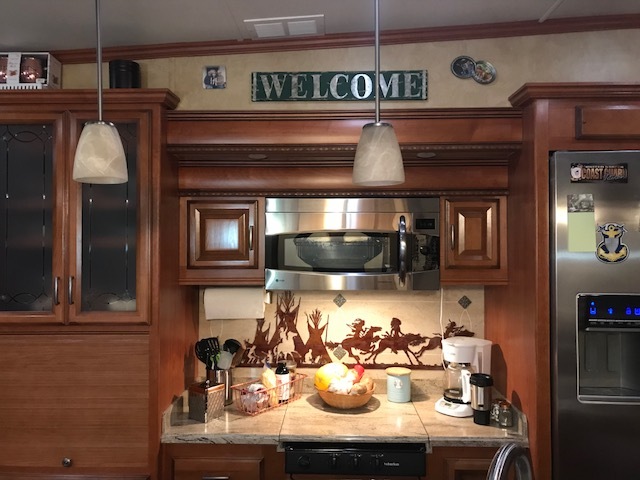 Having a kitchen with counter space has been one of the best changes - Susan loves using the island to cook from and having a gas cooktop again. 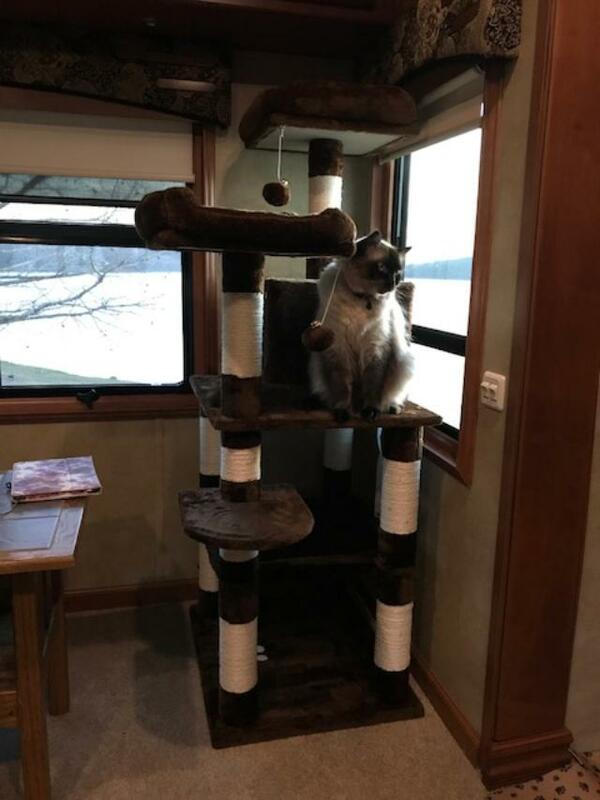 We have changed a few things to "make this our own" such as - we removed the far recliner and added a kitty tower so Kona and Boomer can climb and relax as well as we do. Susan has also added some personal touches with decorations that are uniquely ours aka "Redneck Chic" which equates to a homey feel that we both are comfortable with. Travel in 2018 was much slower than in 2017. In March we started our journey when we left Texas to spend a few days in Oklahoma. We visited with family as we stopped to see Mom (Bridget), took a drive up to visit with Raymond and LouAnn and even managed to attend a surprise birthday celebration with the Harrell sisters. April found us in Tennessee for a month. Susan was looking at new campers - yes, Susan and not Brett this time! No, we were not really thinking of changing again soon but then soon is a relative term and could mean anything from a few days or weeks to months or years (another story for another blog). Our April home was at Deer Run RV Resort just outside of Crossville, TN. The sites were HUGE! We had enough room to park the camper, jeep and the truck and still have space for the picnic table and Susan's hammock. The owners were friendly, the park clean and the rates affordable. It did snow a couple of times but it was spring near the mountains. During our time in TN we met up with the Kirbys and other "friends" - many were people we have talked with through various forums, pages and Zello but we had not actually met until we all attended the East Coast Rally for heavy duty trucks. Virtual friendships morphed into actual real life friendships and many campfires were enjoyed by the group. Of course there was Jeeping! Susan worked and Brett went out to play.... LOL. In all fairness, he offered to wait for Susan to have a day off but she pushed him out the door. So a convoy of jeeps gathered and they headed off to the Catoosa Wildlife Management Area http://www.morgancountytn.gov/tourism/catoosa_wildlife_management_area.php for the day - or rather a couple of days as there was too much fun to be had for them to just go once. Another jeep exploration was to Windrock Park http://www.windrockpark.com/. Susan did tag along for this trip and the entire day was spent on the trails. As April wound down, we watched our friends depart one by one as we settled in for a few days rest before heading east. May arrived with itchy feet and off we went. We hit North Carolina on May 2nd for a month stay in the Hickory area. Our first night in town we were visited by our friend Steve and our daughter came in for dinner. We had many plans for May - some that we completed and others we saved for another time. May and June were dedicated to relaxation and time with our daughter and friends. We stayed in Hickory for a month - and of course Brett went Jeeping. Then June found us in Ohio for a time before we turned and made a quick trip back to Oklahoma - quick being slow travel over a week as we like to take our time. July had us ordering a new camper before we left Oklahoma - (still a story for another blog). We spent three weeks in Missouri visiting our son and Susan's family and then another eastward turn. We stopped over in Paducah, Kentucky for some sightseeing, and yes, another day of Jeeping and exploration. August found us back in North Carolina with plans to help our daughter move. That move didn't happen as planned but we were able to enjoy another good visit and spend more time with friends in the area. As you know, this is not our normal blog - only a few pictures and links to what we have seen and done. We have had many request to restart our blog and so will be making a few more catch up blogs in the coming weeks. Until then, see ya from another area soon. On June 2nd we said goodbye to Las Vegas, the city that never sleeps, and started our journey to Utah. We had to change our route just a little but still had much planned for this fun state. Unlike a lot of our other posts, this month will be few words and lots of pictures. We have decided to just let the pictures speak for themselves. Bryce Canyon was an absolute eye opener and left Susan and I in awe. While pictures don’t capture the entire scene, we hope that you get the idea. We really only had a couple missions to embark on from this base camp, to visit Bryce Canyon National Park https://www.nps.gov/brca/index.htm and to ride our motorcycle on the Grand Staircase-Escalante National Monument Tour (Hwy 12). Unfortunately, due to weather we were not able to make the motorcycle trip this time. UT! In Moab we had a nice stay at OKRV http://okrvpark.com/. The park was a bit of a diamond in the rough - few amenities but super nice people. 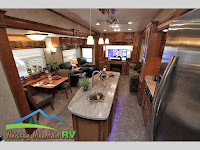 OK RV honors Passport America discount and during the month of June there was no limit on the number of days we could stay. We did have to pay an extra $5.00 per day AC charge (this is added during June, July and August) but with the temperatures in the 100s daily and the ACs running almost nonstop, we did not complain. Total cost with the AC charge was only $24.50 per day - that is a bit above our $20 per day budget but we have scrimped enough other months to allow us to splurge a bit and remain within our cumulative daily budget. Susan and I decided that June was probably going to be our “vacation” month so to speak. We have stayed on a pretty tight budget throughout the year, but Moab just had too much to do…lol - and using the excuse of it being our anniversary month Susan didn't argue. Along with everything we did, we still found plenty of time to off-road in the truck and we went places we probably should not have been in a pickup, but we had a blast. We crossed over an 11000’ pass https://stateparks.utah.gov/stateparks/wp-content/uploads/sites/26/2015/02/LaSal_Pass_OHV.pdf where just days before they had opened the trail for the summer season - and apparently NO ONE knew it was open yet as we did not run into anyone along the pass and locals were surprised to hear we had been on the pass. There was still snow in higher elevations and we drove through it as we climbed, weaved and zigzagged back and forth along the mountain pass and saw beautiful country. We actually had so much fun on that adventure that we did it again on a different day, except this time we ran into a bit of bad luck when we blew a tire. Our off road adventures in the truck kinda came to an end after that but the tire shop in Moab was great. Luck was with us and we were able to get me a new tire installed and purchase a new spare the next morning. Thankfully someone else had had tire trouble the week before who had the same exact tires we have on the truck and they had purchased a full set of four - leaving 3 perfectly good tires with less mileage and wear on them than the ones we had. We purchased two at a great discount Thank You Moab Tire http://www.pointstire.com/moab! The last thing we saw while there was the Hole in the Rock just south of Moab. It was a short tour and yes a bit of a tourist trap, but very interesting. The house was literally carved in the side of the rock - no need for AC or heat as it maintains steady temps year round. It did have running water and electric - even had a large hand chiseled bath tub! I would post the link but then you would hate me as last time I went to the home page it popped a "zeus virus" which is a tracking scam that is set up to make it look like your computer has been compromised and directs you to call "tech support" so, as an alternative if you run an image search you can see pictures, we weren't allowed to take inside pictures. As with Bryce Canyon, we were left with pure amazement of the country we live in during our visit to Moab and hope some of the pictures will show the beauty of this place as well. I KNOW we will be back. Did I mention that Moab also caused other changes in the Wickett travel plans? Ok, maybe it was Moab and a few too many conversations with Eric Highland. 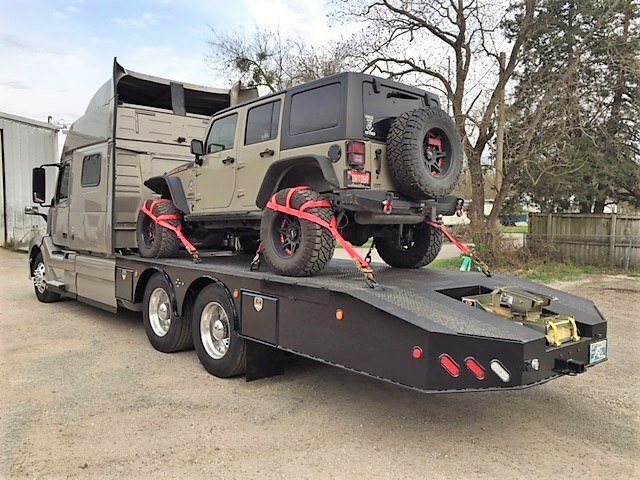 We ordered a Jeep Rubicon Recon Unlimited…lol Susan and I have always talked about a Jeep and we have always wanted one but just never could figure out how to fit it in. Well this time instead of finding reasons it would not work, we decided to simply say we will make it work. 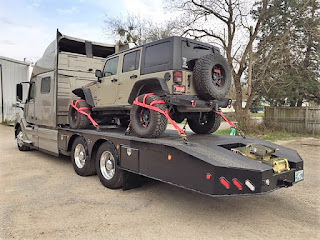 So just as we arrived at Hill AFB I made a call to a dealer in Austin, TX (Covert Jeep) and placed an order. (more about that next month). With Moab in the rearview mirror we were starting our slow migration north and made our last stop of June at Hill AFB FamCamp in Layton, UT http://75fss.com/famcamp. What we found when arriving to Hill AFB was a nice facility and a few things to do in the area. But you have to wait until next month to see what we did. We hope you enjoy all the pictures. Taking the shuttle tour is a must! Temps on Jeep day HOT! Hi! We are Brett and Susan (Hyde) Wickett, a couple who has left the rat race, sold our house and moved into our home on wheels. We started "Living the Dream" in August 2016.